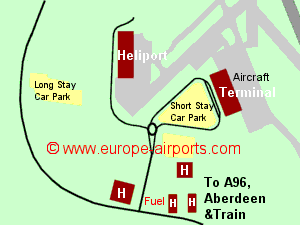 Aberdeen airport is also one of Europes busiest heliports, serving the North Sea oil and gas industry. There is a train service from Dyce station which is a short taxi ride to the other side of the airport (10 minutes costing around 8 pounds) and a bus connects the airport to Aberdeen city centre for around 1.50 pounds. 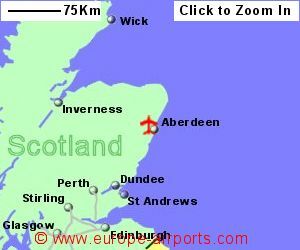 A taxi into Aberdeen will cost around 15 pounds. There are several bus and coach services between the airport and Aberdeen with a journey time of approximately 30 minutes. 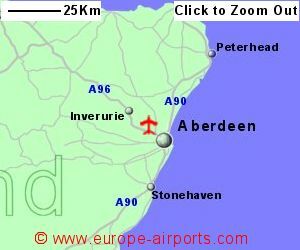 Aberdeen airport has 8 bars/restaurants, 12 shops, 2 currency exchange facilities, a lounge with business facilities, fuel station, Internet access points, and FREE WiFi Internet access. Two hotels are located on the airport which can provide conference facilities, plus two more hotels nearby. Terminal expansion and improvement is continuing in 2018/19. 3.1 million passengers used Aberdeen airport in 2017, an increase of 4% from the previous year. Approximately 0.5 million of those passengers fly by helicopter.